Gilmore Car Museum expects new Duesenberg exhibit to attract more visitors to Hickory Corner. In addition to its special Duesenberg exhibit, the Gilmore Car Museum has dozens of antique cars and historic buildings to explore. 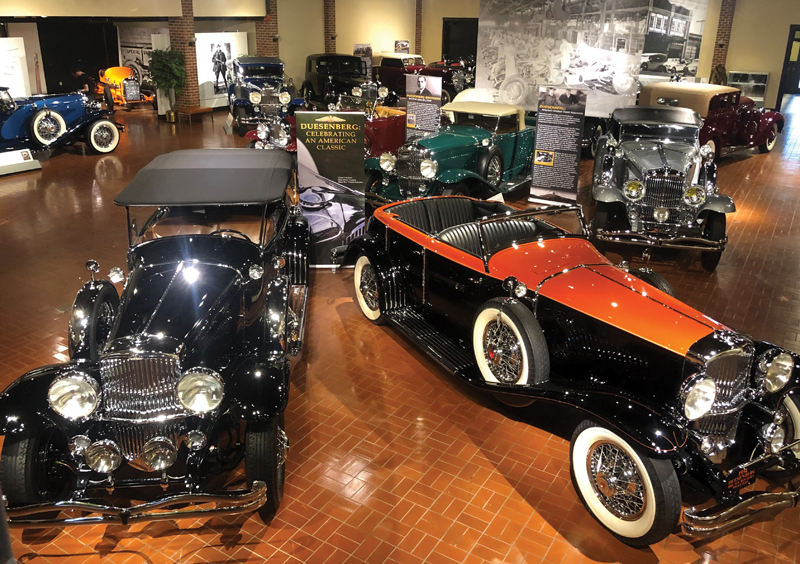 One of the largest museum exhibitions of legendary Duesenberg Motor Cars can be found — at least through September — at the Gilmore Car Museum in Hickory Corners, about a half-hour drive north of Kalamazoo. The Duesy showcase, featured in the museum’s premier gallery, opened Nov. 9 and includes 20 of the rare cars. One is a dazzling blue 1929 Duesenberg J-111, which was built for the 1929 New York and Los Angeles auto shows and became the company’s demo in Hollywood. Eventually, the vehicle was purchased by the son of silent movie star Buster Keaton. Another car is a vibrant yellow 1932 supercharged Model SJ racer that set several speed records at Bonneville. Other notable Duesenbergs in the temporary Gilmore fleet are a supercharged 1933 Duesenberg SJ-528 that was first owned by Lt. Col. Jacob Schick, best known as the inventor of the cartridge-style Schick razor and the first electric razor; a 1930 Duesenberg J-143 Roadster Convertible Coupe owned by Al Capone compatriot Jake “The Barber” Factor; and a 1931 Duesenberg Supercharged J-345 (known as a disappearing-top convertible coupe) whose first owner, a New York underworld boss, was killed the day after he bought it. Past exhibits have included muscle cars (that collection has found a permanent place elsewhere in the museum), Kalamazoo-built cars, alternate fuel cars, and A.J. Foyt Indy Car and NASCAR racers. Another new exhibit at the Gilmore opened in September. It spotlights barn finds —unrestored classic vehicles that have spent several decades in garages or barns. “People love that stuff, and with shows like ‘Antique Roadshow’ and ‘American Pickers,’ people are fascinated by the story of how these cars are found looking like that,” Follis says of the exhibit, which is scheduled to conclude this spring. Permanent exhibits at the Gilmore, which opened in 1966 as the hobby of retired Upjohn Co. Chairman Donald Gilmore with 35 cars, include more than 400 vehicles in free-standing buildings dedicated to classic car clubs and legendary nameplates like Pierce-Arrow, Franklin, the Model A Ford, Lincoln, Cadillac, and LaSalle. The Gilmore campus comprises a sprawling 90 acres of scenic rural western Michigan. 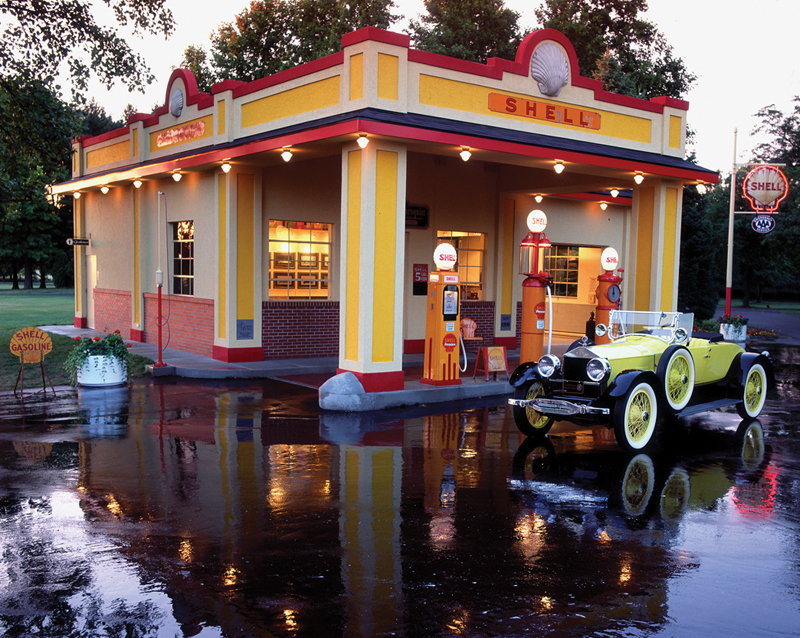 In addition to eight restored 19th century barns full of cars, there are vintage dealership replicas, a 1940s diner, a re-created 1930s Shell service station, a train depot from the 1890s, and reconstructed turn-of-the-previous-century factory buildings.